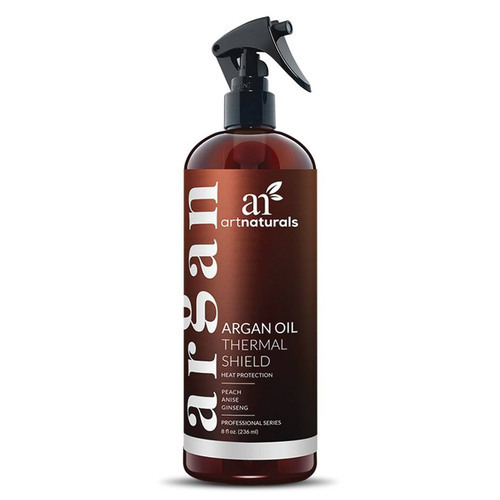 Our protective spray against flat-iron heat, the Argan Oil Thermal Shield is infused with Argan Oil to help prevent damage, breakage and split ends. This sulfate-free formula adds botanical extracts of Ginseng, Anise, Gingko Biloba, Irish Moss and Peach to help rehydrate hair and prevent further heat damage from daily blow drying or flat ironing. Natural oils, proteins and vitamins help smooth and calm frizz and flyaways as they coat hair shafts and help stimulate hair follicles. The result? Softer, more lustrous hair. Our Argan Oil Thermal Shield is also ideal for helping protect hair during prolonged sun exposure and damaging UV rays. Safe for color-treated hair. Hair no longer has to take the heat—it’s got a protector. Notas: Cruelty free product. Paraben free. BPA free. SLS free. Ingredients: Water (Aqua), Cetrimonium Chloride, Emulsifying Wax NF, Cetearyl Alcohol, Behentrimonium Chloride, Cyclopentasiloxane, Aloe Barbadensis (Aloe Vera) Leaf Juice, Helianthus Annuus (Sunflower) Oil, Camellia Sinensis (Green Tea) Extract, Mucor Miehei Extract, Ganoderma Lucidum (Mushroom) Extract, Lentinus Edodes (Shiitake Mushroom) Extract, Mentha Piperita (Peppermint) Oil, Salvia Officinalis (Sage) Oil, Rosmarinus Officinalis (Rosemary) Oil, Hydrolyzed Pea Protein PG-Propyl Silanetriol, Simmondsia Chinensis (Jojoba) Oil, Argania Spinosa (Argan) Kernel Oil, Tocopheryl Acetate (Vitamin E), Panthenol (Vitamin B5), Caprylyl Glycol, Sorbic Acid, Phenoxyethanol, Fragrance (Perfume). Recomendações de uso: Spray onto freshly washed hair and comb through evenly. Style with tools as usual.